Barefoot opens 15 minutes prior to class time. Please arrive in enough time for students to change and use the bathroom before class starts. In each class, we begin in a specific way to make students feel welcome and to warm up muscles carefully. Missing the beginning of class can disorient a younger child and lead to injury for an older one. Latecomers also distract the class. Students need to be picked up promptly. Parents arriving late will be charged a late fee. See payment policies for details. Students need to be brought to and picked up at the door. Students may not be on the driveway without an adult. Traffic is one-way only: enter at the Barefoot sign, exit by the buoy. Please don’t block the driveway or back out onto Rt. 9W. Spaces are available in our parking area as well as along the driveway on the left. To keep traffic flowing, please pull all the way down to leave room at the entrance. Two-three cars can park hugging the stone wall (as you enter, on the right and in front of you). 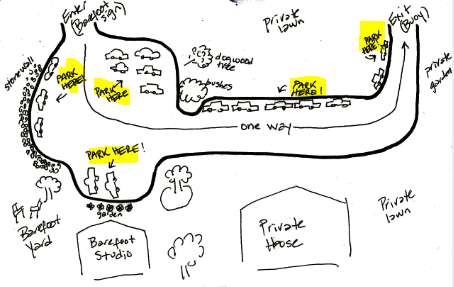 Two-three cars can turn left at the entrance and park facing the bushes and dogwood tree. (These cars get boxed in). Two-three more cars can park behind them. Two cars can pull in to face Barefoot (to the left of the door). Four-five cars can parallel park along the driveway next to the big lawn across from the house. These are great spots for those who arrive early and for those who don’t want to get boxed in. Feel free to make yourself comfortable in the waiting room, as well as outside in the Barefoot yard. Due to insurance reasons, we ask that you and your children avoid the house and private lawns. Also, all children not in class must be supervised by an adult. Children may not climb on trees or stone walls. Also, please keep kids out of the gardens. Thank you for helping to keep Barefoot a safe place for everyone. We invite parents to observe class each semester during our “open class” weeks. Until this day, please no peaking in windows or doors during class as this seemingly innocent interruption can cause great distraction. (We know it is hard to wait!) Please let the teacher know if you would like to discuss your child’s progress. Modern II, III, IV and Ballet students are encouraged to wear leotards or snug fitting tops and footless tights or fitted dance pants. Fitted clothing allows teachers to more easily offer corrections. However, the comfort-level of our students is our priority, which is why we offer suggestions instead of requirements. Modern dancers should have bare feet; ballet students need ballet slippers. 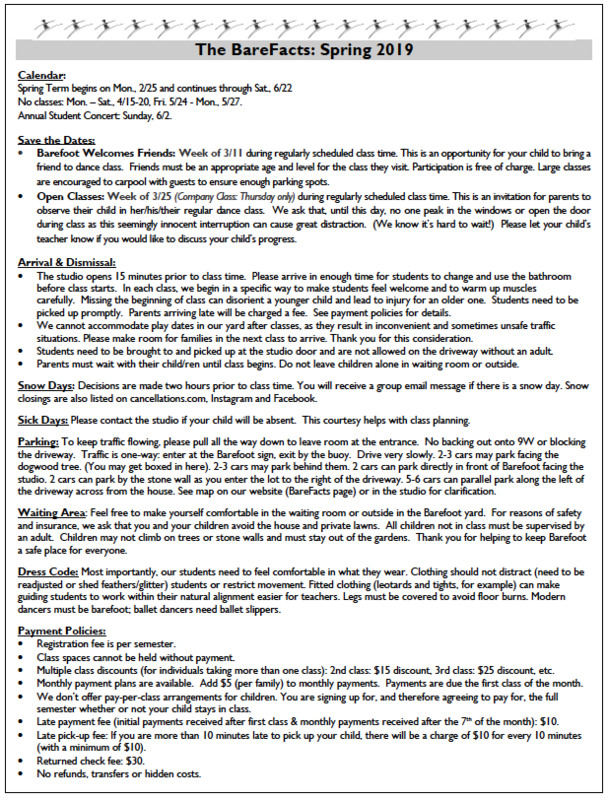 Please check with your child’s teacher before purchasing new items in the spring in case we plan to coordinate colors for the student concert. All current families will receive an email in the case of a snow day. You may also check our Facebook page and cancellations.com. Decisions are made two hours prior to class. Please note: we allow for one cancellation per semester for each class. In the case of additional cancellations due to weather, we offer opportunities for make-up classes and notify parents of the details via email. Please call the studio if your child will be absent. This helps with class planning. During the year, we host bring a friend week. This is a special opportunity for your child to bring a friend to their regularly scheduled class. We also invite parents to observe their child in class during open class week. At the end of the year, we invite and encourage all dancers to participate in our annual student concert. Please check the calendar for dates. Registration fee is per semester. Class spaces cannot be held without payment. Multiple Class Discounts (for individuals taking more than one class): 2nd class: $15 discount, 3rd class: $25 discount, 4th class: $35 discount. Monthly payment plans are available. Add $5 (per family) to monthly fee. Payments are due the first class of the month. (We don’t offer pay-per-class arrangements for children. You are signing up for, and therefore agreeing to pay for the full semester, whether or not your child stays in class). Late payment (initial payments received after first class & late monthly payments) fee: $10. Late pick-up fee: If you are more than 10 minutes late to pick up your child, there will be a charge of $10 for every 10 minutes (with a minimum of $10).